Shaydlyn Robinson, 14, of Owls Head, jumps off the Rockland Public Landing at high tide in June 2011, as her friends look on. 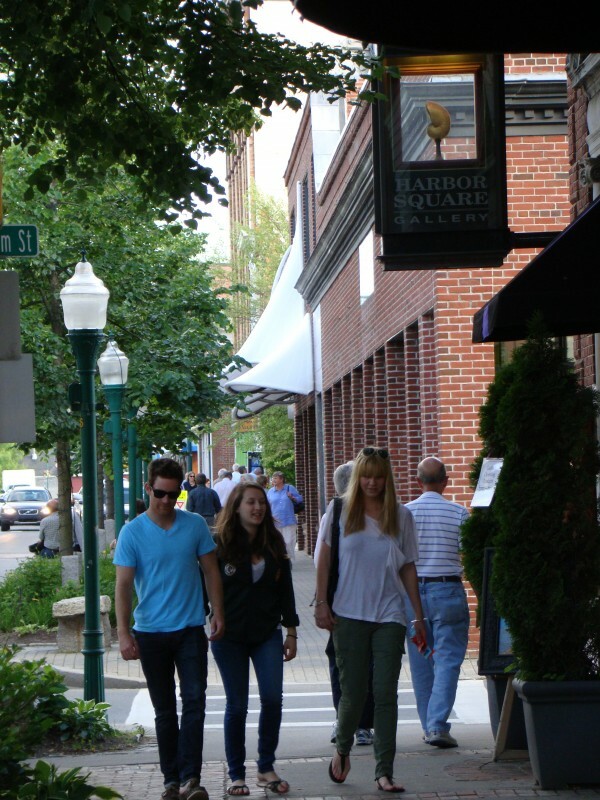 Rockland's Main Street is a busy place in the summer and early fall, thanks, in part, to an increasing number of cruise ship visits. Midcoast communities are increasingly the destination of cruise ships from around the world — vessels that bring with them the all important tourist dollars. Maine overall has seen a doubling of the number of cruise ships making port calls in the past 10 years but that increase has been much greater for harbors such as Belfast and Rockland, according to statistics compiled by CruiseMaine. Rockland, for example, recorded eight cruise ships coming to its harbor in 2003. By last year and again in 2012, that number had nearly quadrupled to 29. Belfast went from eight in 2003 to a projected 27 this year. Rockland will see two large ships make port calls in the next week, although one is not a cruise ship but a floating high-end residential condominium complex. The 644-foot The World has 165 individual residences aboard the 12-deck high vessel, with an average occupancy of 150 to 200 residents with a crew of 260. This week the ship is visiting Maine ports in Eastport, Bar Harbor, Rockland and Portland. The visit by The World in Rockland will be followed by the second visit this season of the 684-passenger cruise ship the MS Regatta. The 594-foot Regatta will be moored in Rockland Harbor on Tuesday from 7 a.m. until 11 p.m. Passengers, and some of the 400 crew members, will be brought ashore to the public landing by smaller tender vessels. Lorain Francis, executive director of Rockland Main Street Inc., said local merchants are happy to have visitors whether they are from small cruise ships, larger cruise ships, or aboard the Maine Eastern Railroad. She classified the Regatta as a midsize cruise ship. “She creates a busy day. There are people on the street,” Francis said of cruise ships such as the Regatta. Rockland got its first, and so far, only taste of a large cruise ship in October 2009, when the Jewel of the Seas made a one-day port call. That 962-foot ship carried 2,500 passengers and a crew of 760. Rockland businesses and government had been working for several years to attract such large ships as a way to generate more customer traffic for the region. Francis said the Jewel of the Seas brought in a large amount of visitors, but that the smaller ships also make it a good day on Main Street when they are in port. “The passengers stroll on our Main Street, they eat in our restaurants, they shop in our shops,” she said. The Farnsworth Art Museum and the many art galleries also are locales visited frequently by all visitors including those from cruise ships, Francis said. CruiseMaineUSA, which promotes the cruise industry in the state, reported in 2010 that the cruise industry spent $36 million in Maine, a 5 percent increase from 2009. The cruise industry generated 692 jobs statewide and had wages totaling $21.2 million for Maine workers, the association reported. CruiseMaine estimates that Rockland will have 4,512 cruise ship passenger days in 2012. That figure is determined by the number of passengers multiplied by the number of days they stay in port. While Rockland has seen a nearly quadrupling in the number of cruise ship visits, its passenger traffic pales when compared to Bar Harbor and Portland. Bar Harbor will have an estimated 138,592 passenger days this year, followed by Portland with 67,758 passenger days. Rockland comes in third in terms of passenger days. Boothbay Harbor is fourth with an estimated 3,070 passenger days in 2012. Camden and Belfast are tied for fifth, both with 2,450 estimated passenger days this year. Bath is estimated to have 2,058 and Eastport 724. No economic impact study has been conducted locally, according to Shari Closter of the Penobscot Bay Regional Chamber of Commerce. But the trend is for more visits to Rockland, according to the CruiseMaineUSA study. Amy Powers, the director of CruiseMaineUSA, said the increase in the Midcoast ports is due largely to the addition of ships by Guilford, Conn.-based American Cruise Lines Inc.
She said American Cruise Lines operates weeklong cruises that make stops only in Maine ports. This year, the American Cruise Lines cruise ship Independence has been the most frequent visitor to Rockland with 17 port calls in 2012. The 215-foot long Independence carries 100 passengers on each visit. The American Glory — which along with the Independence is owned by American Cruise Line — made four visits to Rockland this year. The 166-foot long American Glory carries 49 passengers. The 184-foot long Grande Caribe, which carries 96 passengers, has visited Rockland three times this year. The Regatta has made one visit with the second and final of 2012 scheduled for next week. While not considered a cruise ship, The World will bring several more hundred people to Rockland for the weekend. While the smaller ships have been welcomed by city officials, there has been some opposition to the largest of the ships. Less than five months after the Jewel of the Seas made its port call in Rockland, the city’s Harbor Management Commission, an advisory panel of citizen volunteers, issued a report that warned of the potential downsides from what it termed mega cruise ships. The Harbor Management Commission said the largest of the cruise ships create environmental concerns such as diesel engines that “spew exhaust equivalent to 10,000 cars,” ocean currents that can bring sewage discharged three miles out to sea to the shores or harm the lobster industry. The commission also voiced concern about other visitors and shoppers avoiding downtown Rockland when such a large ship arrives. The commission had recommended that the fee for mega-cruise ships increase from $1 per passenger that had been levied in 2009 to $8 per passenger. The 2013 Rockland fee for cruise ships that anchor in the harbor will be $6 per passenger. Vessels that dock at the public landing will be paying $2.50 per foot in 2013, up from $2.25 in 2012. The smaller cruise ships also pay for trash and sewage disposal. The harbor management commission noted it supported cruise ships but had concerns about the larger ones and that they pay a fair price. “Rockland should not sell itself short for an easy dollar on a vague promise of economic development,” then-Commission Chairwoman Louise MacLellan-Ruf told councilors in 2010. Rockland Mayor Brian Harden said he has been pleased with the increase in the small and medium cruise ships that come to Rockland. “Cruise ships in general are a positive economic driver. It’s part of our future,” Harden said. Harden said that there have been no difficulties with the small and medium ships that have come to Rockland. He said the one visit by the larger cruise ship did require more planning and presented logistical issues to handle that many people at one time, but that this was not the case with the smaller vessels. “We’re in a positive place,” Harden said.